If you keep your eyes open, you can see good (and bad) examples of customer experience management everywhere you go. This morning I found an example of what to do at a local central Texas Sticker Stop store. 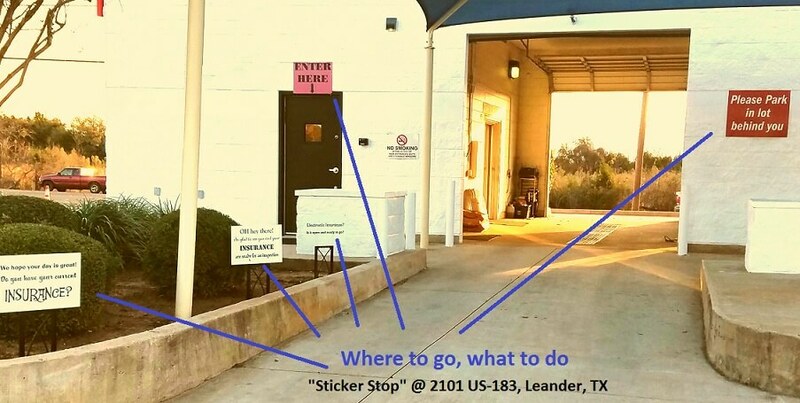 Upon arriving on-site to get my car inspected for my Texas vehicle registration renewal, a series of questions immediately came to mind, such as: “Where should I park my car, front or back? And, once I park, should I pull straight up to the bay or should I choose a parking spot?” (After all, I wanted to get in and out in 10 minutes, as their sign promised I would!) No sooner did I start to wonder these things than I noticed a friendly sign ushering me to the back. Boom – question answered. Then, once I had pulled around back, I saw several more user-friendly signs that took all the guess work out. I was directed as to where to park, where to enter the building . . . I even saw reminders about bringing my proof of insurance inside. Wow! All of the stuff I needed to get me in an out quickly. I complimented the owner of the store (Sticker Stop on US-183 in Leander) for his marketing savvy and went on my way – all in under 10 minutes. This guy gets it. His signage made both his life and my life a little bit easier. No-brainer. Yet most businesses just don’t take the time to do this – and customer experience suffers. Includes helpful instructions that guide them on their path. This can include shortcut banners to popular pages, answers to commonly-asked questions, and a clear, unambiguous site menu structure. Do this and you will at least be one step closer to being the kind of business communicator your customers and prospects wish every business was.